Updated on 2010-11-14: See Casual Californian and the Loquat Lady. In honor of Bike to Work Day, here's a survey of some of the many ways you can dress while cycling to work or play. They illustrate that it doesn't have to be all about spandex bike shorts, loud tops, weird bike shoes, and bulbous helmets. Here are some gals cycling back from dinner on a Friday evening in the bike crazy Temescal neighborhood of Oakland, California. They've got a nice mix of safety and style going. If cycling as serious transport is ever going to go mainstream one of the many things that has to change is the perception that cycling means dressing up like a giant "day glow" lollipop. Folks seem to have many different issues with that look. Folks don't seem to like the crisp formality of this look. One reason for that may be the similarity it has to these guys. These fellas are two of Vancouver's finest. I ran into them at the 2010 Olympic Winter Games while they were guarding the Olympic torch. Many folks simply don't want to look like they are in uniform when they cycle. What follows are some pictures of folks I have met on the road recently showing you can get it done on bikes without all that. A perfect case in point is this guy I met at Polk and Geary one Saturday while doing the story on Johan and his bike accident. This guy is looking fabulous in his green and black striped knee socks, matching green T-Shirt, and Elvis-style sunglasses. He's getting his PhD in urban planning and transportation design at San Jose State. He is big in to bike commuting but you wouldn't know it from this outfit. He's a great example of the opposite end of the spectrum from the sporty or cop look. He's got no helmet, gloves, or special shoes. He's not letting the bike dictate anything. Still, he is definitely sporting an equally bold look. This fellow is demonstrating the same thing albeit from a classic Californian perspective. The bike even ties in to it. His beautiful Saluki bike with its vintage leather/spring seat and canvass bag looks as comfortable and casual as he does. You've also got to love the "Wallaby" shoes. Don't see those that often anymore. Very cool. This gal also is not sacrificing style or comfort or even her options for free speech. She's looking very comfortable in a beautiful skirt. Apparently, those are not a problem to ride with. She's also put on her bike the same bumper stickers she would have on her car. A pleasant surprise was her bike rack which was full of freshly-picked "loquats". Delicious! Other than the helmet, you wouldn't know she was a cyclist. There are lots of folks showing a hybrid approach to safety/style/comfort. This guy, for instance, is pedaling and looking fine in his business suit. His side rack ensures no backpack straps will wrinkle his blazer. Nevertheless, he's got a helmet and gloves just in case. He was really moving when I took this so, for him, a little extra safety is probably not a bad idea. 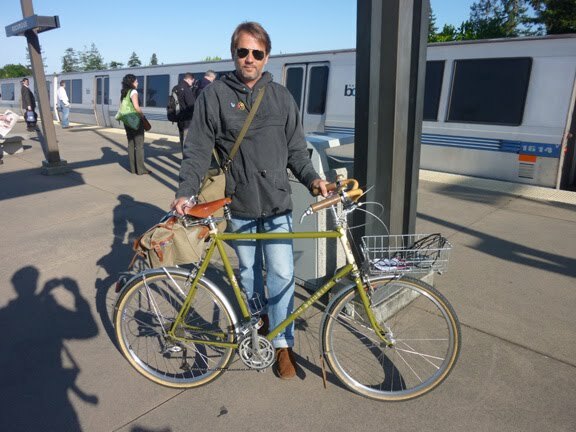 This fellow has taken it up a notch with his pleated slacks and his sweet all chrome Bianchi Pista. These dress clothes didn't get in the way of performance. He tore out of the BART station and pretty much kept up with car traffic across an intersection. Here's father and daughter who've balanced safety with style while going out to breakfast at The Creamery (a cool new café across from the SF train station) on a mellow Saturday morning. Love the Pea Coat on dad and the cute "wellies" on daughter. Also, a gorgeous red bike for two. Apparently, dad makes these himself. Another look I found interesting was this gal. She's dressed in regular clothes. She was just pedaling home from work. No need to sport a special look for that. Like most folks, she's opted for a helmet but otherwise, you wouldn't know she was a cyclist. Nevertheless, check out those shoes. She's riding home in clogs. Definitely a very comfortable choice for walking but not an obvious choice for cycling. I asked her if they ever slide off while she rides. She says they work fine. Those particular clogs are beauties too. Check them out in the close up. Since then I've met lots of folks who swear by slip on shoes. I never would have guessed that. Swinging back toward the sporty direction is this guy shown by the BART train. He's got special cycling shoes for clipless pedals. I'd bet he's got other bike-specific clothing underneath. On the outside, though, its just jeans and regular clothes. I see this look a lot and for good reason. With this you get the comfort and efficiency of the bike-specific attire but you avoid the lollipop look. This guy had a sweet race bike as well. Nothing like driving a Ferrari to work every day. Below is a picture of me cycling on the Las Vegas strip. I'll admit it. I'm like the "day glow" lollipop. 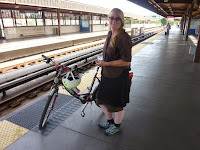 I go the whole nine yards: bike-specific pants, shoes, gloves, helmet, and jacket. After biking for years, I've succumbed to the full bike uniform. I mitigate that by just throwing something over my bike attire when I arrive. 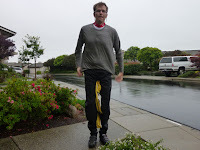 Street clothes work if you are going a few blocks but after a few miles (for me at least), they chafe, soak with sweat, or get bike soile with chain grease or gutter runoff. Not to mention, if you take a spill with no gloves or helmet you use your skin to stop. I've torn through gloves after falling at only 5 miles an hour. Luckily, I've never taken a high speed fall but Johan can attest that it warrants a helmet. All this is not to mention the rain which begs for the water-resistant or quick-drying bike clothing even more. In the end I found that, as with anything, a bit of planning for the worst-case scenario pays off. Given that, I bite the bullet and wear the bike suit. Slipping regular clothes over spandex when you reach your destination is remarkably quick, easy, and socially acceptable. I've also found that bike shoes with mountain bike clips are decent walk shoes that look decent with black or blue jeans. Regardless, the beautiful thing is that all these people are out there looking however they want to look while making their health, the air, and the traffic a lot better. Bless them and anyone new who cares to join them on Bike to Work Day or everyday. P.S. Here's a CNN story on John Leguizamo cycling to work in NYC. Go John! I hope you start a trend amongst celebrities.